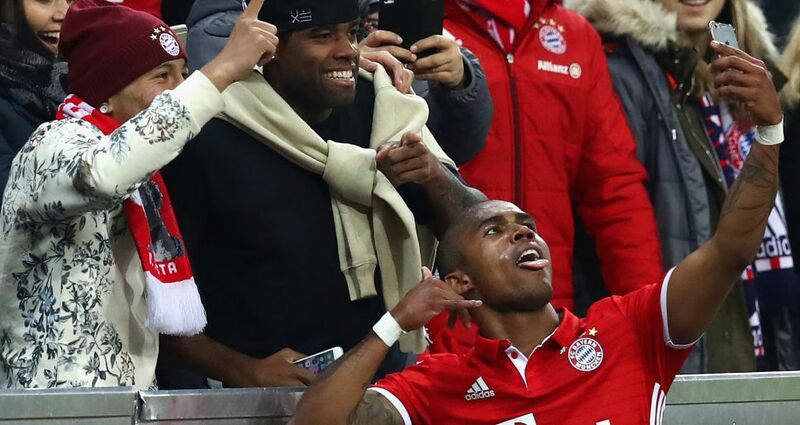 Douglas Costa's performance in FC Bayern München's 2-0 win over Borussia Mönchengladbach evoked memories of how the Brazilian winger burst onto the Bundesliga scene a year ago. He made a picturebook start to his career in Germany, and on Saturday he added another – uniquely genuine – photo to the collection. After opening his account for the season in the 31st minute – his first goal in the Bundesliga with his right foot after seven with his left – the 26-year-old knew exactly how to celebrate. He raced over to near the bench and grabbed a phone off one of his friends in the crowd, taking a selfie which was doing the social media rounds quicker than he could make it back into position. There is no rule against celebrating in such a way. "We live in a world of social media," said his coach Carlo Ancelotti. "Of course I would prefer my players to remain focused on the game, but these things happen. He had a good game and he can get away with this." He should have plenty of chances to please his coach with a goal and a selfie too having sufficiently impressed on his first start of the season after recovering from a thigh injury. He gave balance to the team on the opposite side of the field to Arjen Robben, ensuring that Bayern had two lethal channels of attack.